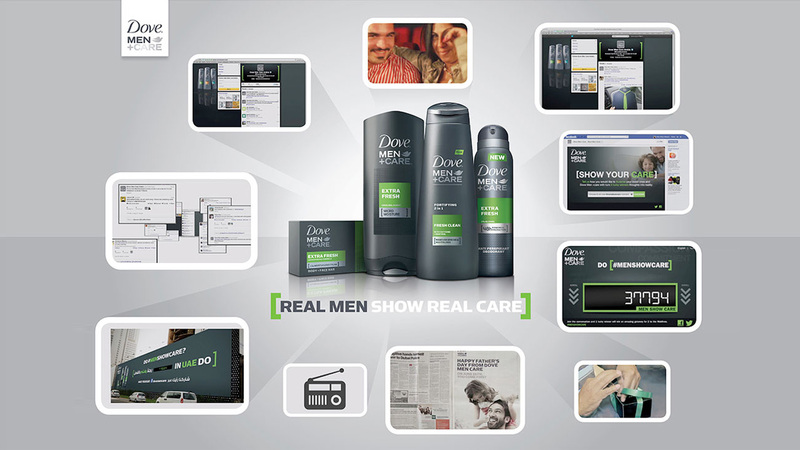 In July 2012, Dove decided to enter the male personal care category with the launch of M+Care range. The objective was to establish a challenger brand that doesn’t simply come in and fight for share without providing men with a real differentiator. 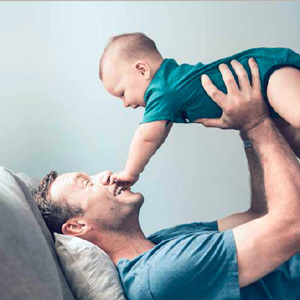 Dove is brand that understands real men and provides real care through the products in the region. But how can you launch a range dedicated to real men in a market that is 63% male yet only 7% of personal care products available were made for them? It is hard for an Arab Man to accept the idea of buying a skin care product for himself as it goes against his tough image. Men in the region have always portrayed an air of nonchalance towards the category by simply using what’s available. Add to that the name of the product; Dove Men+Care. The goal was to uptrade the switching men from a generic personal care product ( shower gel, deos or hair care product ) to a more premium men one which is Dove Men+Care. Convert him to Dove Men Care and make the brand part of this daily routine. Men in the GCC are portrayed as tough, unconcerned and macho. This is due to the rooted Arab/Eastern culture, traditions and harsh environment they live in. As part of their upraising, they have to always look strong and on top of their game, to an extend that showing emotions is a sign of weakness. As an Arab/ Eastern man, you are requested to be the leader, do manly things and make sure you get enough money for the family; no room for emotions or evetaking care of yourself as this is not what an ARAB MACHO MAN does. That shows what sort of massive task was ahead. We started with a small but powerful gesture; that got people talking. We went on search to find 3 brave men who were willing to show their love and care on a public stage. We invited 3 men to secretly record a message of love and care. Their message was screened in cinema prior to the blockbuster they had come to watch with their families. The wives were overwhelmed. Their families, hundreds of moviegoers were so pleasantly surprised. All this was captured via hidden cameras and driven on YouTube and other social media platforms. This was not simple awareness of a brand’s positioning., Our local video went viral and was a big hit. Reaching the hearts of 2 million views on YouTube, picked up by international blogs. Up to date this small gesture touched 4.7 million people and demonstrated that the stereotype is either outdated, or was wrong to begin with. This validation is the spark of a conversation that will vindicate the men that have the ability to care and the strength to show it, real men. We needed to turn the conversation starter into a conversation. We took it to the masses and used different channels to get people involved and asked them “Do Men Show they Care” through examples like “should men put kids to bed” or “should men compliment their significant other in public”. Things that sparked a bit of a conversation, but didn’t push the envelope towards embarrassment. After all, this was to start a long term conversation, not create short term shock value. We went into Radio and used popular radio shows, asking listeners to call in and share their stories. This wasn’t an overnight phenomenon, we could see how it spread slowly in the beginning and then faster later. As soon as we took the conversation into digital space through Facebook and twitter, our counters started reflecting the spread of engagement. We eventually used OOH media on Shiekh Zayed Road to reach more people tat had too many degrees of separation from our first group to join, but still wanted to show that they care. The fact that men were already showing their care helped mobilize the others, until we reached a point where 84% of men had shown that they do care. We used OOH and digital channels (Facebook & Twitter) to tell the world that real men do care.We made them realize that their caring side is important. An in-mall activation challenging men to show their caring side in front of an audience through customizing gifts to their loved ones broke down man’s stereotype. We wanted to give back to these caring men. Hence, we created a print campaign and a special promotional pack thanking fathers On father’s day. But we are not stopping here. In the future we will continue to helping men show their caring side. At the time of writing this case, A Facebook app is going live that asks men how they would like to show their care for their loved ones. It’s not about a fancy dinner or luxury trips; it’s about men actually learning something to surprise their loved ones. Whether it’s cooking, dancing or playing a musical instrument in front of 10,000 people, Dove will make it a reality. All they need to do is have the will to care. © 2019 MemacOgilvy. All rights reserved.